The Bureau of Developmental Disabilities Services (BDDS) coordinates services for individuals with developmental disabilities in order for them to become as capable and self-sufficient as possible. At the local level, the BDDS Service Coordinator is the placement authority and works with individuals with developmental disabilities and their families to plan and access community residential services. BDDS funds residential services to provide for the individual as long as their services are needed. Have substantial limitations in at least three of the following: Self-care, Language, Learning, Mobility, Self-direction, Capacity for independent living or Economic self-sufficiency. The process for becoming eligible for a group home can be time-consuming and is dependent upon an opening in a group home. The person requesting services would first need to contact the Bureau of Developmental Disabilities (BDDS). All referrals for group home placement come from BDDS. The local BDDS office can be contacted at 877-218-3059. Once BDDS has been contacted, a Diagnostic and Evaluation (D&E) of the individual will be ordered. Completion of the D&E is the responsibility of the BDDS office. The person requesting services will need to have a physical completed by their primary care physician. This physical is also referred to as the 450B physical. The D&E in conjunction with the 450B is submitted to the local BDDS office for review. After the BDDS office reviews the information, it is submitted to the Division of Disability and Rehabilitation Services (DDRS) where the eligibility for Level of Care (LOC) is determined. Once the individual requesting services is approved for Level of Care in a group home or ICF/MR (Intermediate Care Facility for Mentally Retarded), a facility with a vacancy in a group home will contact the local BDDS caseworker and request placement packets. Information included in a “packet” consists of information gathered during the D&E. It is very important that the family members providing information for the D&E give precise and accurate data to the evaluator. Parents are proud of their children’s accomplishments and will state, “Yes, she can dress herself independently.” When, in all actuality, she needs help with fastening buttons/zippers, picking out weather appropriate, clothing and not wearing dirty clothing items. Please be truthful and respectful of others safety by giving accurate data. For example, if you know your son has a dangerous habit of running out into the street without looking on a daily basis, please inform the evaluator so this information is included. It does not affect the decision whether or not he would be accepted into the group home, but it would be information needed for determining level of care, staffing ratios, and necessary safety precautions that would need to be in place. The person requesting services must have Group Home Level of Care eligibility as determined by Bureau of Developmental Disabilities. The person requesting services must be currently eligible for health insurance through Indiana Medicaid. The person requesting services must be at least 18 years of age. The person requesting services must complete a physical examination within 24 hours prior to or 48 hours after admission into the group home. The person requesting services must have a (negative) TB test within 30 days prior to admission. The person requesting services must be functioning at a level that they will not endanger themselves or others. The person must actively participate in the treatment goals set at the Individual Program Plan and benefit from the services provided by the group home. 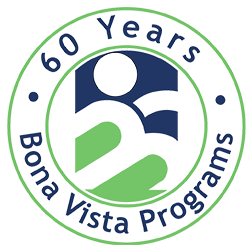 Bona Vista Programs currently has 6 Group Homes in Kokomo, and 2 in Peru. Group homes are an alternative to institutional care. In this type of setting, the focus is on the development of skills for daily living. Eight individuals (co-ed) live at each group home. There are different levels of group homes based upon the Level of Care of the individuals living in that particular home. The BDDS service coordinator will identify people who are eligible for group home placement based upon Level of Care approval. When a person requesting placement has been reviewed and their information “fits” into the current opening, the Director will contact the family. The family members and/or person requesting services will visit the group home and meet with the QMRP, House Manager and the Director of Residential Services. The QMRP, House Manager, and the Director of Residential Services will explain the Residential program and begin gathering medical history, schooling, behavioral needs, self care needs, etc., to determine their individualized needs. Often the person requesting placement will visit the home several times prior to actually moving in. These visits are a chance to get to know their future housemates/staff and are based upon each person’s preference/needs. Once the TB test is complete, and another physical appointment has been scheduled the actual move-in date can be set. The Director notifies the BDDS caseworker of the move-in date. The Director of Residential Services notifies the President, Business Office, Agency Nurse, Workshop, Social Services, and other appropriate parties of the admission verbally and/or via a Social Services Movement form of the admission date for the person entering the residential Group Home. 30 days after admission, an initial Individual Program Plan (IPP)/Individual Support Plan (ISP) meeting will be held to discuss adjustment to the group home, progress over the past 30 days, goals for the future, and to answer any questions. Within the 30 days, the QMRP gathers information on functioning level in their essential ADL skills. The QMRP will complete a Functional Assessment in which the goals for the next year will be based.